Tasty Five: The Blissdom Canada Edition, with Peach Ginger Muffins! Next Wednesday, I fly off to Toronto on my way to Blissdom Canada for the second time. Has a year really passed already? This year, I am working with two amazing sponsors! Both have great sites filled with all sorts of recipes, and are products that I use in my kitchen all the time. Yes, I know it's Thanksgiving weekend, and you are all likely eating turkey, but I can NOT pass these by. They look just WAY too good. Sticky and sweet, they would be just the thing for a party. You could call them bat wings and serve them at a Halloween party! Who says you need to buy microwave popcorn with all those added chemicals? Pick yourself up some parchment bags by Paper Chef and make popcorn at home yourself-this recipe adds some butter, spice, salt, and a squirt of lime-I couldn't stop eating it! Check out the sea salt and chocolate or parmesan and thyme recipes. I think I may just have to whip these up in my hotel room at Blissdom. I am often asked for recipes to accommodate special diets, and so when I saw this I couldn't let it pass by without sharing with you. I can only imagine how frustrating it must be around the holidays for those of you who struggle to find recipes that the allergic members of your family can eat. This one is for you! Head on over to my friend Alexis to get the skinny on her dairy free frosting, and her yummy dairy/egg free chocolate cake as well. 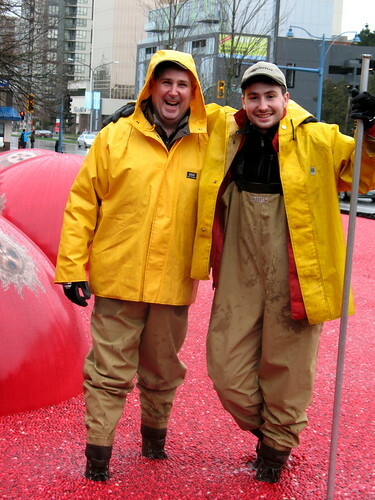 It's Thanksgiving weekend up here in Canada, and what is Thanksgiving without cranberries? Smitten Kitchen shows you three different ways to do it up right so that your turkey sandwich will not be bare. 5. Jamie is roasting turkey! Okay sure, this video is from a Christmas special, but I enjoyed watching about the basic principals of roasting a turkey, and then some great recipes for leftovers. What's on your plate this weekend? Over here, it's not Thanksgiving without pumpkin pie. There are still some peaches left at the store though, and these muffins are fantastic for breakfast. Slathered with butter and spiced with ginger, they are something wonderful to wake up to. The recipe called for oat flour, which I didn't have on hand. You can, however, just put some rolled oats into your food processor and whiz them until fine. Also, make sure the peaches are on the firm side, or they will break apart in the pan. First, make the topping: In a saucepan over low heat, stir together the unsalted butter, honey, and ginger. When it's warm and melted together, toss with the peach slices. Set aside. In a large bowl, whisk together the flours, sugars, baking soda, baking powder, and salt. Set aside. In a medium sized bowl, whisk together the butter, milk, sour cream, egg, and gingers. Stir the wet ingredients in the dry, stirring with a wooden spoon until just combined. Don't over mix! Spoon batter into greased muffin tins (or lined, I like Paper Chef parchment cups) and lay the peach slices over top, pressing them into the batter. Spoon some of the ginger butter over each muffin as well. Bake the muffins for about 25-28 minutes. When you take them out of the oven, take them out of the muffin cups to cool so they stay crusty. These were good for about two days, and then the tops began to go a little mushy. Best to eat them right away!